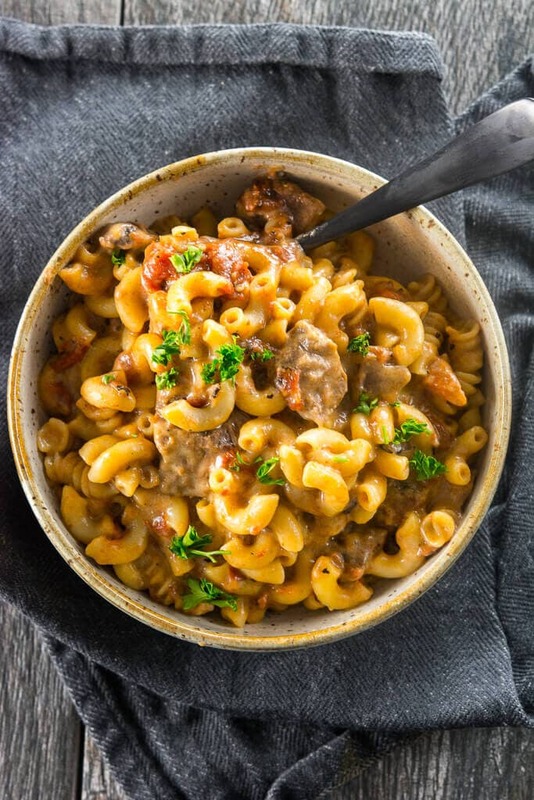 Mac and Cheese is amazing on it’s own, but when you add your favorite beer you end up with a grown-up comfort food you’ll want to make again and again. Even better? 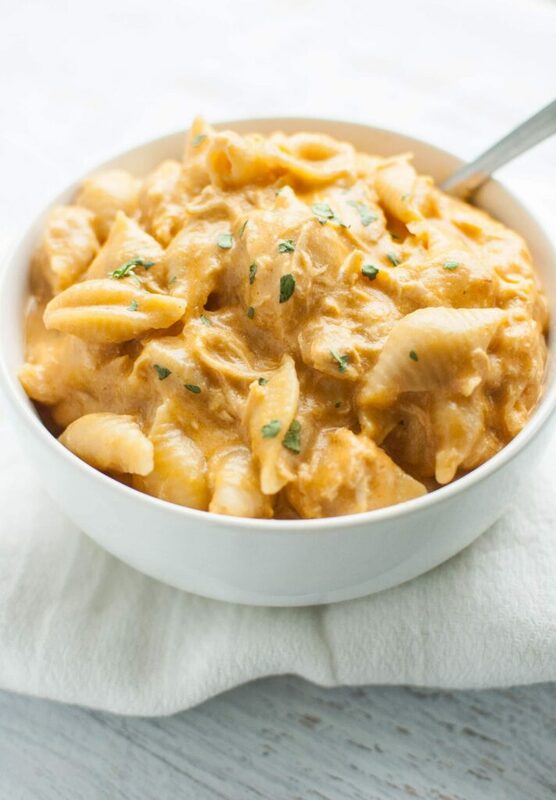 Slow Cooker Beer Mac & Cheese! Attention grown-ups!! 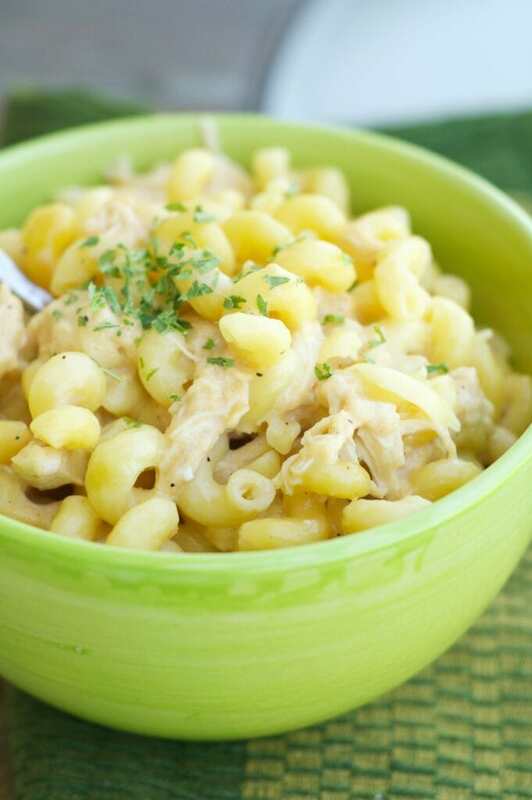 You never have to eat mac and cheese from a box again! Why? 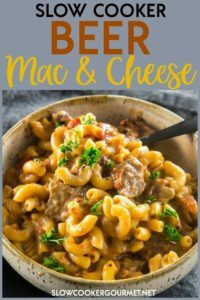 Because using your slow cooker to make delicious homemade mac and cheese, and more specifically Slow Cooker Beer Mac & Cheese, is so easy that once you try it you will never go back! 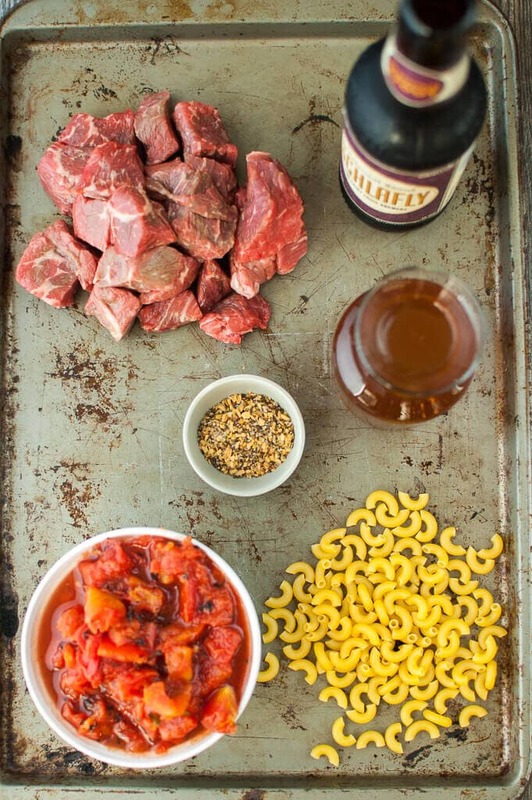 Plus, what packaged mac and cheese that you know of comes with beer? Beer mac and cheese. A real thing. A real good thing. Did I mention how simple this is to make? 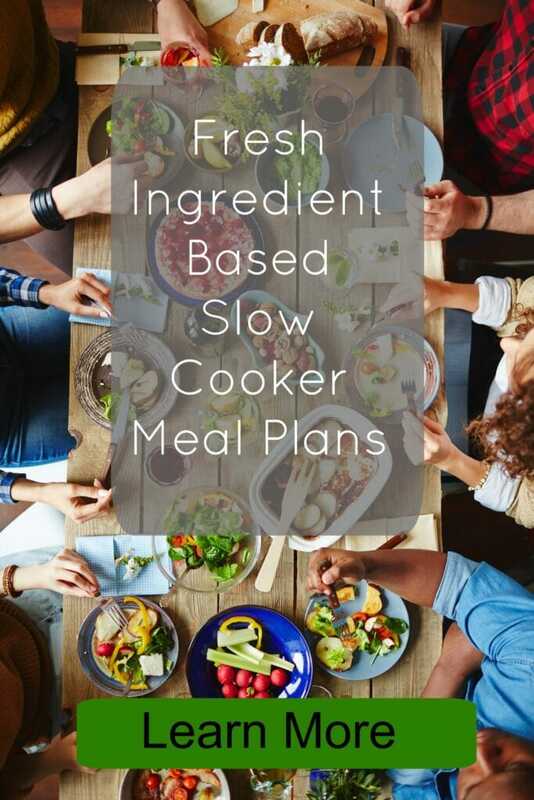 Just 5 ingredients into the slow cooker will get you started! Some nice lean stew meat makes this a delicious beefy meal that will be plenty filling even for hearty appetites! A simple seasoning blend makes for an all in one option that makes prep even that much quicker. Could this recipe possibly get any better?? Yes it can! Let’s add some beer!! I used an oatmeal stout and that’s what I would recommend for this recipe. That’s not to say another beer wouldn’t work, but I haven’t tried it. 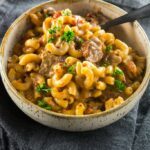 It can be easy to go wrong when adding beer to recipes and they can give off a flavor that doesn’t work with your food, so if you get daring and try something else and love it, be sure to let me know!! Once your meat is all cooked you will add the pasta to the slow cooker. That takes anywhere from 20-45 minutes to cook depending on the type of pasta you use. I like the Pronto! pasta from Barilla, it cooks up quicker and stays more firm in the slow cooker. 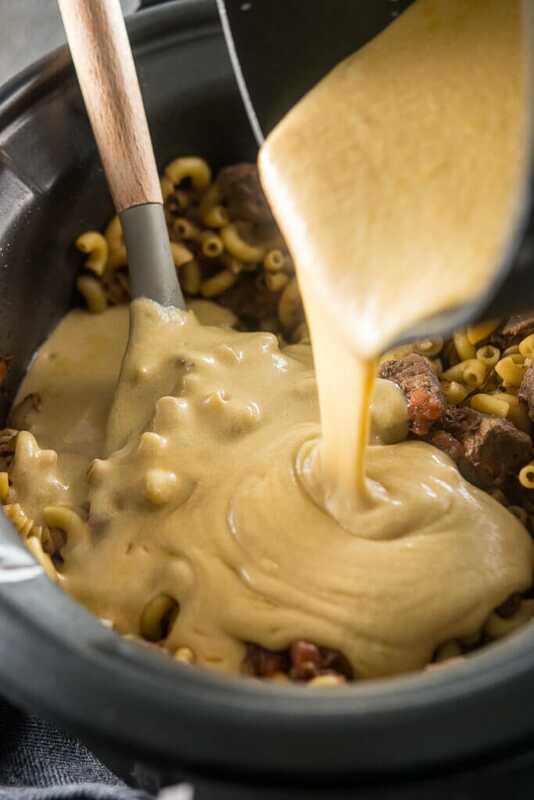 While that’s happening, you can move over to the stove to whip up a quick homemade beer cheese sauce. Stay with me here… homemade cheese sauce is much easier than it sounds, I promise! 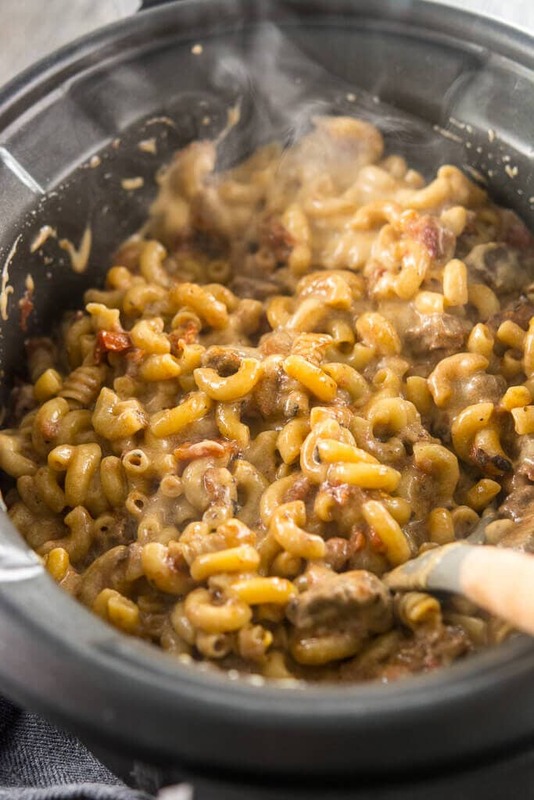 Stir it all together at the end for the most delicious mac and cheese your grown up mouth has ever tasted! 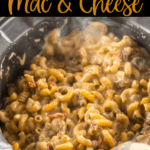 If you love Mac & Cheese check out some of my other recipes! 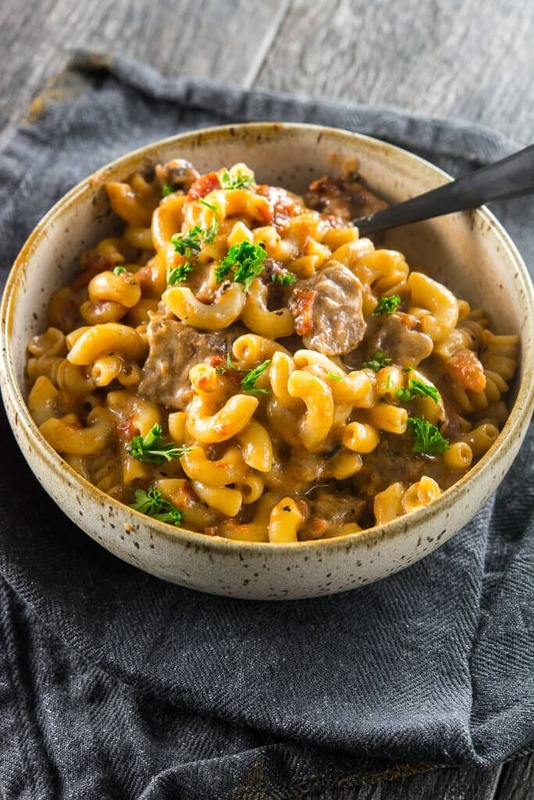 Slow Cooker Mac and Cheese is amazing on it's own, but when you add your favorite beer you end up with a grown-up comfort food you'll want to make again and again. Note about pasta: use an elbow noodle for best results. I recommend the Barilla Pronto! noodles for the best result in the slow cooker. 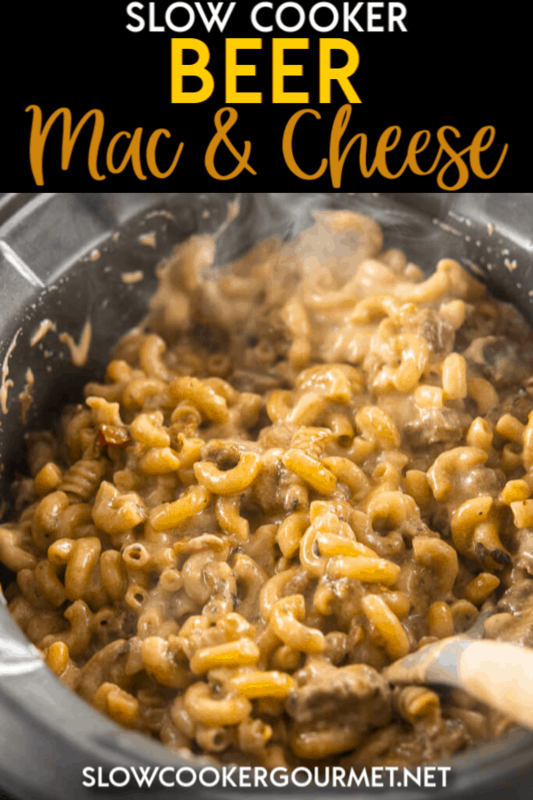 Mac & Cheese in the Slow Cooker is amazing! 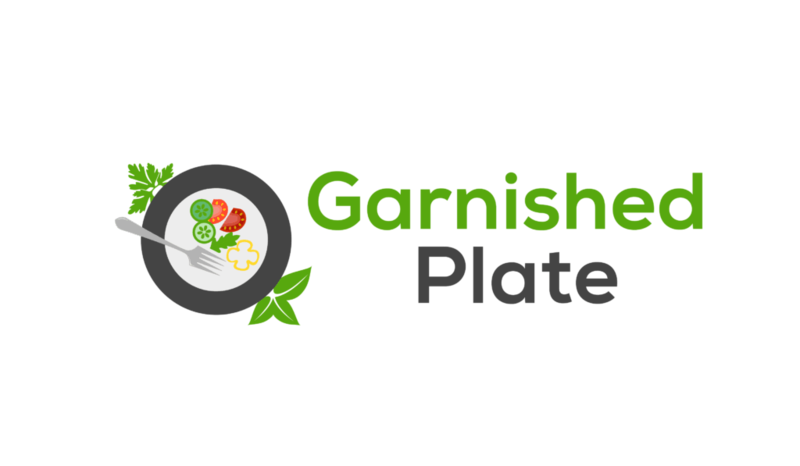 Try out these other delicious recipes too!! Can’t figure out what to make for dinner every night? Let us help!! I made this yesterday, and it’s really good. I actually have too much of it; had to freeze some for later. I think any really mild stout would work best. I used a Lagunitas stout; I love their beer, but almost all of them are fairly potent. Some of the bitter beer flavor kinda lingered. I think I will try something like a mild red ale, Guinness, or an oatmeal stout next time. I also changed to bowtie pasta, because it seemd fun. And it still worked just fine! Good recipe! Awesome!! We also love Lagunitas beer, but I agree this is great with something like a milder oatmeal stout. Freestate makes one that is really tasty!! I made this on Sunday was totally bummed. The noodles fell apart, it was gross. Flavor wasn’t bad but ugh, what a mess. I followed recipe exactly. If I made it again, which I might, I would drain most of the liquid, cook the noodles separately and then put it all together. Then it would probably be good. Maybe worth another shot. I’m sorry it didn’t work out for you!! How long did you end up cooking the noodles that they ended up overcooked? Was there still liquid left? I was wondering if I could use this with chicken or ground beef instead of stew meat? We don’t recommend ground beef in this particular recipe, but chicken would be a good alternative. Can this recipe be doubled and still cook okay? I’m wondering if there would even be enough room in the crockpot though.also..they do not sell the pronto noodles at my walmart. How would I need to adjust if I’m just using regular elbow noodles, and should I use the regular sized ones or large? My best guess would be that yes, you could double it if you have a 7 or 8 quart slow cooker. If using regular noodles (of any size) they will just take a bit longer to cook and you may find you will need to add a bit more liquid if they start to dry out. I’m looking to make this for 2 people. Would just cutting the amounts in half work? Also, do you cook the pasta before putting it in the slow cooker or do you let the pasta cook in the slow cooker? Thank you! Hi Jen! Yes, you could easily cut this recipe in half and it will still be more than enough for 2 people. You don’t need to cook the pasta first, but for best results look for the Barilla Pronto! noodles. I’d suggest a 3 quart slow cooker for 1/2 size of this recipe. This is going on my menu right now! I can’t wait to try this. It looks absolutely amazing!